"It is not like Leningrad under siege of course, but people have already started eating grass," Svetlana Antropova, a trade union leader in the town of Pikalyovo woefully complained to a Russian newspaper. "They make nettle soup and dandelion salads. What other choice is there?" The solution was promptly offered by Russia's Prime Minister. Vladimir Putin arrived on an emergency visit in this company town and blamed the town's woes on local officials and delinquent private owners of the Pikalyovo industrial enterprises. "Why did you start running around like cockroaches only on the eve of my arrival here? Why wasn't there anyone capable of making the right decisions well before that?" Premier Putin asked, sternly eyeing a group of businessmen and officials. The premier clearly looked like he was ready to lose it. And he had a good reason to. While his protégé President Dmitry Medvedev enjoyed socializing with the members of business and political elites at the St. Petersburg International Economic Forum, Putin had to pace through the grimy workshops of an alumina factory in Pikalyovo, 130 miles southeast of St. Petersburg. His job was much less pleasant – he had to personally micro-manage the local economic disaster recovery plan. "Why does your plant look so neglected? You have turned it into a dump," Putin asked a local administrator and moved on without bothering to listen to the answer. Over 20,000 people in Pikalyovo have been sitting without jobs, paychecks, heating and hot water for several months. All three backbone enterprises, united in a single industrial chain but belonging to three different owners, have ground to a halt after the economic crisis forced all three to dramatically reduce their output. Thinking of business and not social welfare, employers simply sent their workers into unpaid furloughs or laid them off. With the mainstay enterprises out of business, the town's entire economy was soon locked up in a crisis and on the verge of collapse. Wage arrears became chronic last December and there has been no pay at all for the past 3 months. Pikalyovo residents attempted a number of protests demanding their back wages and work. 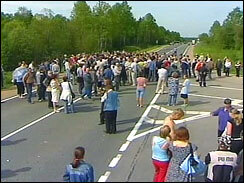 In despair, they even blocked a federal highway for several hours last week, causing a 250-mile-long traffic jam. Apparently feeling a need to stamp out the growing unrest, Premier Putin arrived on an unexpected visit meting out portions of harsh criticism to everyone from local administrators to owners of the enterprises. "Regardless of everything, I made a decision to hold our meeting right here. Not only did I want to come over and see the desolate workshops – hardly a pleasant sight – but I also wanted the authors of what happened here to personally come over and see all this with their own eyes," Putin growled. "You have made thousands of people hostages to your ambitions, non-professionalism and maybe mere greed. This is absolutely unacceptable," the prime minister went on. In a particularly remarkable episode which was shown by all national TV channels, Putin called billionaire Oleg Deripaska – the owner of one of the factories - over to his desk and literally made the latter sign an agreement that would allow the plant to restart operation. "I can't see your signature here," Putin's voice was full of irritation, a very rare scene on Russian television. "Come over to me. 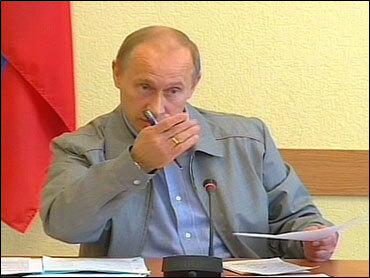 Here is the agreement," Putin said, throwing a pen on top of the document. Looking somber, the unshaven tycoon, seen left, stooped over the desk with a demeanor of a schoolboy and signed the agreement, forgetting to return Putin's pen. "And will you give me the pen back as well?" Putin reminded Deripaska without a trace of politeness. Besides making some steps to relaunch production in Pikalyovo, the Russian premier also ordered that the angry workers be paid over $1.3 million in back wages in full. "The deadline – today," Putin snapped out. The crowd of people gathered outdoors cheered the decisions made by Premier Putin and welcomed his promise that the factories would be pumped back to life soon with an ovation. Making a virtue out of necessity, all government-controlled mass media touted Putin's visit to Pikalyovo as the premier's managerial success and an act of caring for ordinary people. But it is possible that Putin's rage was caused by the understanding that by making Pikalyovo dwellers happy, he was doing himself and his government a major disservice. Inspired by the success in Pikalyovo, people may start hoping that Putin could be blackmailed into helping resolve their problems, too. The 7.7 million unemployed throughout Russia may pour into the streets, blocking highways and demanding that Premier Putin, who remains the country's most popular leader, come and give them their money and jobs back. Russian experts are already talking of the "Pikalyovo syndrome" when protests may spread rapidly to over 400 Russian company towns hit hardest by the global economic downturn. Russia's national budget having enough money to pay all the disgruntled citizens is a moot point. But regardless of the answer, covering Russia's 11 time zones with emergency visits is a tall order even for such a successful manager as Vladimir Putin.